A number of sectors were early adopters of virtual reality technology. Apart from well-known entertainment use, medicine was one of the biggest industries, and we see virtual reality used in healthcare for a range of applications across mental and physical health disciplines. Surprisingly, virtual reality is one the most significant assets of medicine, allowing it to try new solutions, surgeries and extremely risky endeavours within a safe setting of virtual reality. To make it easier to understand, we looked virtual reality in healthcare from first instances to the future use. One of the earliest examples of virtual reality used in healthcare is the Georgia Tech Virtual Vietnam VR scenario, used to treat veterans of the Vietnam conflict with symptoms of Post Traumatic Stress Disorder (PTSD). The University of South Carolina is now developing a virtual reality application for Iraq War Veterans with PTSD. They are using virtual assets which were designed originally for the X-Box game Full Spectrum Warrior. The application they are developing would assess how the experience of war has changed an individual’s responses to situations, and be used to plan any care and rehabilitation properly. 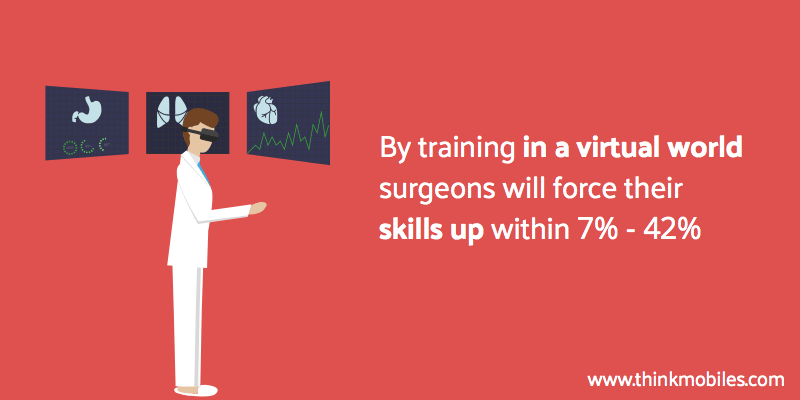 Virtual reality simulations have proven invaluable for teaching and practising surgery techniques. The ability to exercise lifesaving, but potentially lethal operations, in close to real scenarios without endangering lives, is of vital importance. The first virtual reality simulators for surgical techniques came in the 1990’s with a virtual Achilles tendon repair. 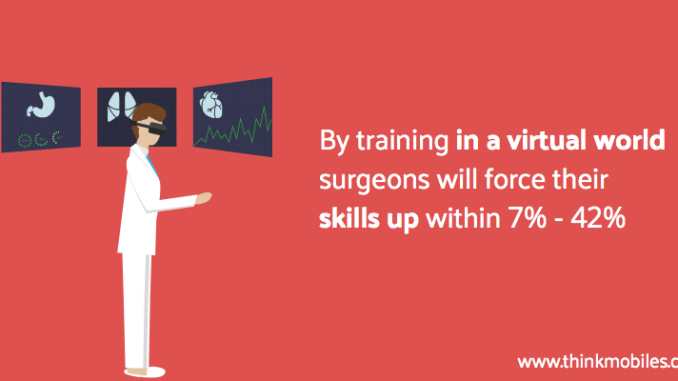 One of the most widely used and effective virtual reality applications for surgeons today is the Minimally Invasive Surgery Trainer Virtual Reality (MIST-VR). This type of use in medicine is proving to give better outcomes in the operating room. A more recent development is the Robotic Surgical Simulator (RoSS) which is a standalone device teaching new surgeons the skills for robot-assisted surgery. As modern virtual reality simulators are so real, they provide very accurate feedback and response to the surgeons every action. As technology advances, surgeons can learn more advanced techniques and develop entirely new methods. Augmented reality combined with wireless technology means that remote “telesurgery” is now an option, increasing the access to expert surgeons, from anywhere in the world. There is a number of companies introducing virtual reality exposure therapy to treat disabling anxiety, PTSD and phobias including fear of flying, driving, heights, open spaces, spiders and social phobia. Virtual Reality Medical Center – VRMC – is one of the companies already operating in the sector and winning awards for their work. Patients are placed in a virtual world and carefully exposed to their fears while learning how to manage or overcome their condition. There are also ways virtual reality can be used to treat certain physical conditions directly. Vivid Vision is treating amblyopia or “lazy eye” in children and adults. They use virtual reality headsets and bespoke applications to deliver different images to each eye, one for the weaker eye, and one for the stronger eye. Through a program of training, and adapting the images shown as the patient progresses, the weak eye gets stronger, and both eyes learn to work together. The Vivid Vision program can even be available at home for follow up or remote treatment – a sign that we are already using virtual reality to treat ourselves! With direction from professionals of course. It’s no secret that the better our state of mind, the quicker we can heal or better cope with debilitating illnesses. Consider also children with severe conditions who have to spend lengthy periods of time in hospital away from their parents, siblings, extended family, friends, and all the things that make them happy. Giving these patients any moments of freedom or happiness, and easing the burden for their families is worthwhile whether it has an outcome for their treatment or not. VisitU is one application in use right now to allow patients to “visit” whenever they want to, in virtual reality, so their visit is as lifelike as possible. It also works for parents and siblings at home, sometimes many miles away, to cope with the hospital stay. Preventative medicine, e.g. simulation of the effects of obesity, smoking etc. It’s interesting to consider at what point doctors and professionals can begin to be replaced by virtual doctors who can diagnose and treat certain conditions without a patient ever needing to leave their home. Remote diagnosis by real doctors is potentially not too far away. For mental health, most of the results so far have been for treating anxiety, phobias and PTSD. There are many applications in development and a few pilot programs. These programs include applications for treating depression and psychological conditions where the potential for virtual reality to make a difference is enormous. It’s expected that both the diagnosis and treatment of mental illnesses will be significantly accelerated, and the costs greatly reduced, by the use of virtual reality in healthcare. The sector is experiencing, and needs, much investment. With that, how virtual reality is used in healthcare, will proliferate. There is no doubt as to the benefit virtual reality could have to our health and well-being. It’s healthcare though, and a minefield of liability, thorough research, trials and analysis will slow down the proliferation of virtual reality in healthcare a little.